Learn how to do the Brain Twister on the Front Mount. The first thing that you need to do when you get into the Brain Twister is get the yoyo onto what is called a Front Mount. There is basically two ways to do this. There is the way that I already demonstrated, which is the faster way to get into it. It is also a little bit more difficult, so I want to show you an easier way first. Then we will get back to the faster method after that. The easier way, all that you need to do is throw a good sleeper, and then you are going to position your opposite hand right in between your body and the string. You are going to push your first finger into the string. Then bring your yoyo hand right under the yoyo, and set the yoyo onto the string. 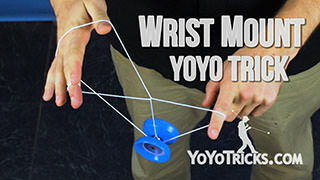 You want to put it on the string right about in the middle so that when you bring your hands together, they are pretty much even with your yoyo hand, just under your opposite hand. That will set you up for the trick. Now, if you are a new player, chances are that your throw is not perfectly straight yet, at least not every time. 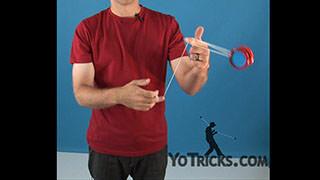 If you try to get the yoyo on the string while it is crooked, a lot of times that will kill the spin really quickly. So if you find that when you get the yoyo onto the string, it just does not seem like you have the spin time you are used to, most likely that is what is happening. When the yoyo is tilted a little bit, it pushes into the string which causes all kinds of friction and that is why the spin dies so quickly. Now the nice thing is, you do not always have to wait until you get a perfectly straight throw to work on this trick because you can actually use the front mount to correct the tilt of the yoyo. Watch what happens. 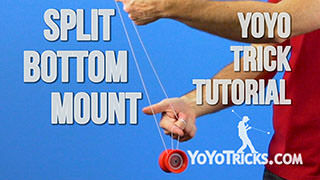 Once you have it in a front mount, you can actually move your yoyo hand to one side which will push the string into the yoyo and you can see that causes it to lean. 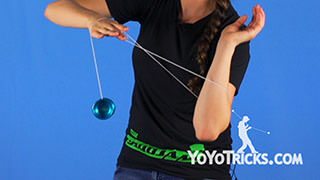 But if you push the string into the other side of the yoyo, it causes it to lean the other way. You can use that to balance the lean of the yoyo out. 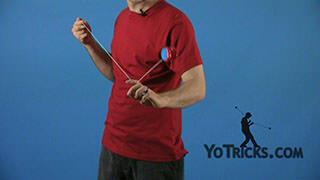 If you throw the yoyo down and it is leaning to one side, you can push the string intentionally into the yoyo to correct the lean and that will set you up to continue to do the trick. Now you do want to be aware that if you are using this tilt correction technique on any mount, this is going to kill the spin a little bit, so you want to get used to it so you can do it quickly and efficiently so you can get right into the tricks. Now once you have got the simpler method down, you definitely want to learn how to get into the mount the faster way as well. Let me show you that before I get into the rest of the trick. The first thing that you want to do for the faster method is you just want to position your opposite hand right in front of your body. You want to point your finger off to the side. Once you have got it set up, you do not want to move this hand at all, because it is really going to simplify the motion and make it a lot easier to learn. Once you have it set up, you are going to get a good throw. You kind of want to throw the yoyo forward just a little bit so that it has a little bit of a swinging motion. You want to use that swinging motion to get into the mount. 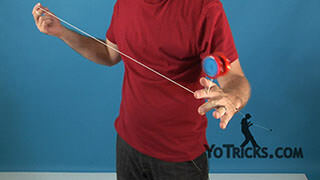 As the yoyo is swinging in toward you, right as the string is about to touch this first finger, all you are going to do is lift this hand straight up. 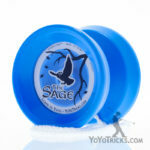 That will accelerate the yoyo over your finger and hopefully land it on the string. As the yoyo is landing on the string, you also want to drop this hand down just a little bit, and that will cushion the yoyo so that it will stay in place. That can prepare you to do the rest of the trick. 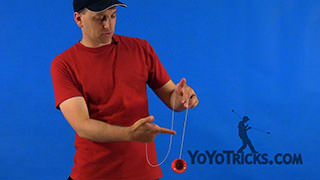 If you forget to bring your hand back down, as the yoyo is mounting onto the string, what can happen is the yoyo will just run right into your finger, which of course will kill the spin. So you want to avoid that. 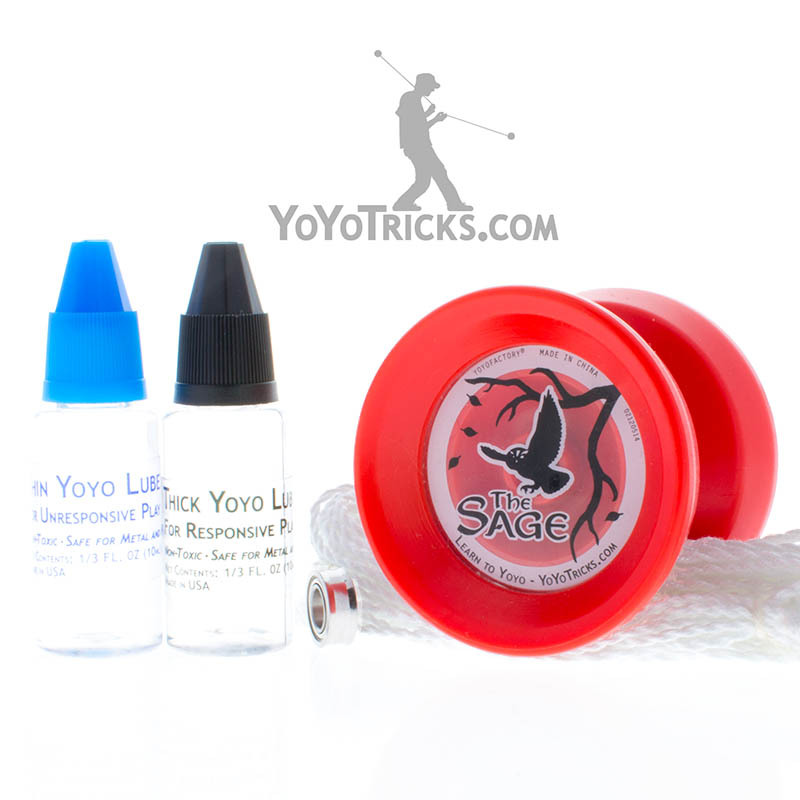 Now in order to improve your accuracy, one thing that you do want to keep in mind is you do want to mount the yoyo really close to your finger, without touching it. 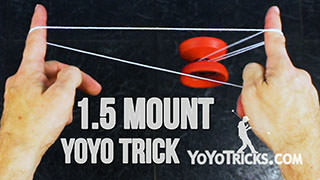 The closer you can get the yoyo to your finger on your opposite hand, the more likely it is to line up with the string so that you will actually hit it when you attempt the mount. Now if you are really struggling with accuracy, it is actually pretty easy to correct the problems that you are having with this trick as long as you are keeping this opposite hand still. Let me show you what I mean. 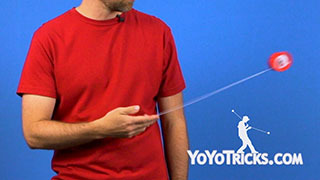 If you are constantly missing to the same side, if you pay attention to where your yoyo hand is ending up at the end of the trick, you can see how far off center it is. Then you know what you need to do to bring it back to center. That is true no matter what side you are missing on. It is always very clear if you look at where your yoyo hand, ok, I just need to bring it back to center, and then you can hit it. So if you try to keep that in mind, to mount the yoyo onto the string really close to your finger, make sure you pull straight up. Then you will find that your accuracy goes up pretty quick and you are not going to have a hard time mastering the front mount in this way. Once you get the yoyo on the string, you want to bring your hands together and put your yoyo hand just slightly under your opposite hand, just like we said before. 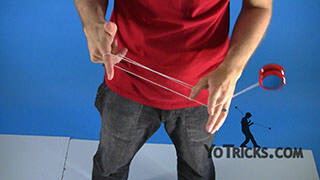 You want to use your yoyo finger to push the yoyo around by pushing into those double strings. When you do it, it is going to be easier to get the yoyo to go around if you swing it forward first, because that is going to give you a little bit of momentum and help you carry it around. 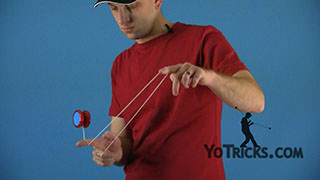 Once the yoyo starts moving, you actually keep your yoyo hand still and you use your opposite hand to continue to move the yoyo around. 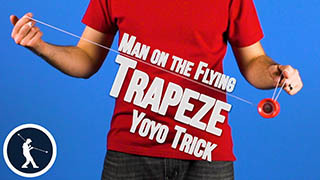 You will notice that the string, it wraps around your yoyo finger. That is totally normal, and that is the way the trick is supposed to work. There is two things you can do with that. You can either get the string off of your finger before you dismount. Or, as you are dismounting and the yoyo is coming back, you can just kind of point your finger forward and the strings will just kind of come right off, so it is not really an issue. Now if you do not want the strings to wrap around your finger, there is a really similar trick that is called a Roll that you can do. All that you are going to do is instead of keeping your middle finger pointed in, you are just going to point it forward. 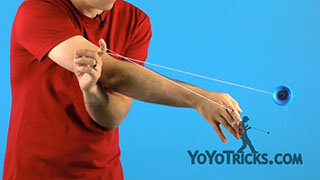 You can see that if you do this, that if you keep your hands just a little bit separate, the yoyo can roll around and the string never wrap around your finger, which is technically a different trick, but it is still a good technique to know. When you are first learning Brain Twister, it is absolutely fine to just practice with one flip. Then bring the yoyo back to your hand. Eventually you want to be able to multiple flips. You will find in your own practice sessions, if you can only do two, and then you need to work your way up, that is fine. Eventually when you have really mastered the trick, you should be able to go all the way around to the point where the yoyo almost touches your finger. Then do your dismount. That lets you know that you have really got it down. 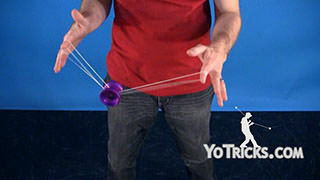 If you get the yoyo onto the string, and it seems to be sleeping fine, but every time you start to do your flips, the spin seems to die right away, or it falls off the string, or starts to twist in a weird direction, most likely what is happening is you are not doing your flips in line with the groove of the yoyo. Let me show you what I mean. When you get the yoyo onto the string, obviously you do not want the string to push into the side of the yoyo. Right now, if I looked through the groove, it is looking right at you. So when I do the flips, I want to do the flips right in that same line that the groove creates. If I go against the groove, even just a little bit, every time the yoyo flips around, the string is really pushing hard into the side of the yoyo. That will kill the spin, it will cause it to lean, it will, it will cause this. It is just a nightmare. So if you want everything to sleep as long as possible and work as good as possible, you need to keep everything really lined up. Now, once you have got the yoyo moving around, then you want to stop it and get the yoyo back. The two ways to dismount are actually the opposite of the two ways that we showed to get into the mount. The first way is the opposite of the easier mount. 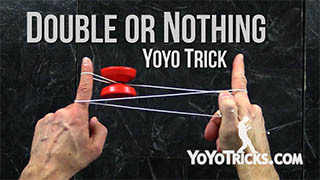 That is, once you finish the trick, you want to stop the yoyo. You just use your yoyo hand to take the yoyo right back off the string. Again, you mount it just like this, this dismount is just the opposite. The second one is the opposite of the faster mount. You get it on just like this. The dismount just comes off right down here. When you are doing that, technically that is the way that brain twister is supposed to dismounted, so you really want to learn this one. And, the flow is a little bit better. You want to go around, and when you dismount, what you want to do is swing the yoyo forward and when the yoyo is as far forward as it can be, all you do is you pull your opposite hand straight down. You can see that that executes the dismount and it will swing the yoyo forward. If you really want to make it look good, you can use the momentum of the yoyo as you are slowing it down, so it will come towards you, swing back out, pull down with your opposite hand. That executes the dismount. Now, one thing that you can do, and this is more old school, this is the way that when yoyos were made out of wood, this is how they used to teach the trick. You can still do it if you have a responsive yoyo. 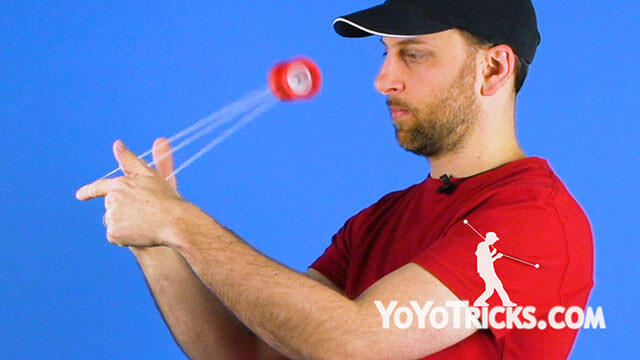 As the yoyo is dismounting, in this way, you can see that it goes right in front of you, so when you pull it back, you can actually loop the yoyo right out. 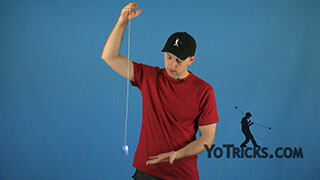 Adds a little bit more flare to the trick, and it is just kind of a fun thing to do if you have got a responsive yoyo. Again, you just use that same motion of the yoyo, bring it back, toss it right back out. 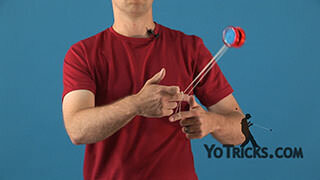 Of course, you will not be able to do the loop at the end of the trick if you have an unresponsive yoyo. The last thing that I want to do is show you a bind that helps you bring an unresponsive yoyo back at the end of brain twister that really couples well with that particular trick. Now we have other videos that teach you other binds, and those are really great too, but I think you will really like the pairing of this particular bind with the trick. So, you do your brain twister, and you dismount, and when you dismount, your hands end up in the same position where you started the trick. So if you were to go back into it, all that you are going to do is set the yoyo right back onto the string, just like this. 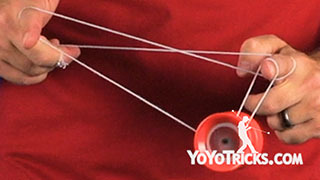 In order to execute the bind, what you want to do is remove the string from the back of the yoyo and place it in front so that you are mounting on the opposite side of the string. This sets you up for the bind. All that you are going to do is pinch the string with your opposite hand. Change the height of your hands, and that will execute the bind. The really important thing to remember is that the yoyo has to be mounted on the opposite side of the string. If you attempt your bind here, it is not going to work. 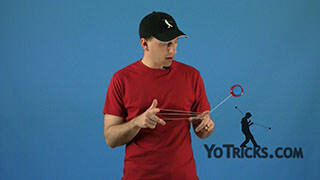 You need to dismount, get the yoyo on the other side of the string, and then the bind will work great. So that is the Brain Twister.